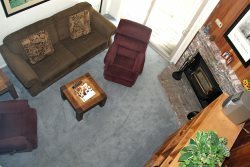 Standard, Two Bedroom with Loft & Three Bath town-home located walking distance to Canyon Lodge Ski Lift Area in Mammoth Lakes. Sleeps up to 8. Each bedroom has a queen bed, the loft has a queen and a twin roll-away bed, and the living room has a queen sofa sleeper. One New Flat Screen TV in the Living Room with VCR/DVD players, CD player. (1300 sq. ft). Phone in unit 760-924-3733. UNLIMITED LONG DISTANCE PROVIDED IN UNIT. The unit is three levels... You enter from an enclosed mudroom. The two bedrooms and 2 full baths are located on the first floor, the second floor is the living room, kitchen, dining room and the third floor is the loft. The third full bath is located off the stairwell halfway up to the loft and the loft is enclosed except for the stairwell area. There are 2 outside parking spaces available. Chamonix Recreation room with large screen TV, reading area, ping pong, foosball, and business center with fax, copier, computers w/ internet and laptop hook-up. Sauna, hydro spas, seasonal/summer swimming pool & BBQ area. Coin-operated laundry facilities located in the common area near the office. COMPLIMENTARY INTERNET and CABLE TV are provided, however NO REFUNDS will be given for connectivity problems or Internet failure. TOT LICENSE 1968-CX86. We enjoyed our stay and your staff was most helpful. Walk to Canyon Lodge unit that was as expected. Plenty of kitchen ware and held 6 people well. Thank you we enjoyed our stay in unit 86. Everything was clean and orderly. Beds comfortable. We rented unit #86 from December 27th through January 2nd. I was a little disappointed with the state the unit is in. It is quite old and definitely needs renovation.